Reasoning is classically viewed as an individual skill enabling a person to reach conclusions based on evidence. More recent accounts, however, have highlighted that reasoning – in the more restricted sense of explicating reasons for actions or conclusions – is a fundamentally social skill enabling two or more people to produce and evaluate one another’s arguments in order to reach joint decisions (Mercier & Sperber, 2011; Tomasello, 2014). Therefore, in making joint decisions with a partner, children must evaluate the evidence behind their respective claims and the rationality of their respective proposals. 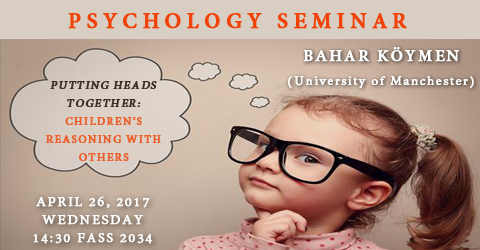 In this talk I will present series of studies in which 3-, 5-, and 7-year-old children produced and evaluated reasons with their peer partners to reach joint decisions. The findings overall suggest that children as young as 3-year-olds are able to reason with others. Children get better at reasoning in late preschool ages and eventually become very “strategic” reasoners at school ages. Overall, these results support the view of children's joint reasoning as a fundamentally cooperative enterprise aimed at making jointly rational decisions.